The Bowens Illumitran slide copier was the best commercial slide copier made. 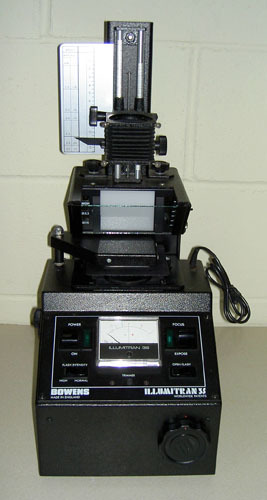 It is completely self-contained with the camera bellows and rail for close focusing, a calibrated flash built into the base, an optional Contrast Control Unit (CCU), and holders for various formats of original slides. It takes many brands and models of camera bodies and lenses (with the right adapters), so that you do not have to have a dedicated camera or lens just for the copier. 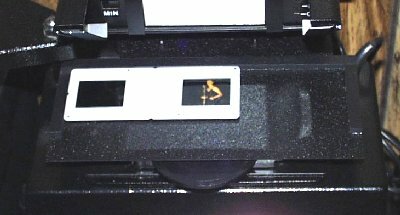 You can even use some models of digital cameras on the copier to get high quality digital scans of your slides. This web page has information on using the Bowens Illumitran slide copier, and has some parts and copiers for sale. Take a look and if you have any questions or if there is something that you don't see, let me know. For Frequently Asked Questions click HERE. For a photo and list of all Illumitran Copier parts click HERE. With most people switching from film to all digital photography, there has been an increased interest in photographers using the relatively inexpensive, used Illumitran copier with their high res DSLRs to digitize their slides and negatives. 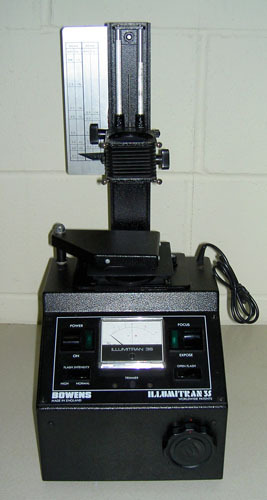 The Bowens Illumitran was designed to make all adjustments needed to make exact copies of existing slides on film, and in some cases to even improve them. These copiers work well with DSLRs, but may need different configurations to optimize the quality of the images and the time it takes to make the copies. For more information on using a DSLR on an Illumitran go to my FAQ page on using the Illumitran with a DSLR. OK. the Bowens Illumitran was not originally designed as a stereo slide copier and Bowens never made a slide holder for stereo slides, but since it is such a good slide copier I have designed a stereo slide holder and have made a small batch that I am now selling. The holder fits late model D, 3, and 3S Illumitrans and works quite well. Below is the Illumitran model that I currently have for sale, a model 3S. It comes either with or without the Contrast Control Units (CCU). With every unit I include: a copy of the instructions, a 35mm mounted slide holder, two pieces of CCU reflecting glass (if needed), and a medium density slide for calibrating your Illumitran. You will need to supply a camera body and an enlarger lens with the correct adapters (I have some listed below, if you need them). These copiers sold new for more than $1,600.00 each, however, I believe that my prices for used equipment are much more in line with the average photo enthusiast's budget. Shipping is extra (it runs about $25 for a complete copier sent by FedEx Ground in the US). Lenses come with the appropriate Illumitran adapter . Here are some new and some used parts to get your copier up and running. 5. 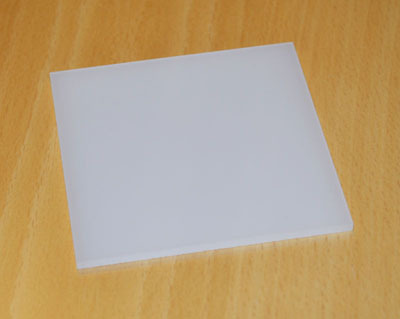 Replacement modeling lamps. Used. One for $3.00, two for $5.00. 6. Ilford Color Correction Filter Set. Complete set of 3" x 3" color correction filters including a UV filter. $20.00 each (you will need two sets if you have a CCU). Credit card payments can be made using PayPal, the #1 online payment service! Just email me with your address and items you wish to purchase and I will send a PayPal invoice.